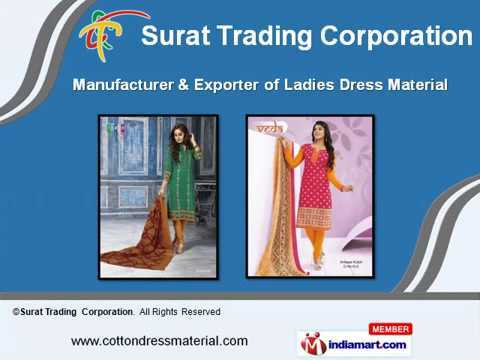 Our sole proprietorship firm, Surat Trading Corporation. was established in the year 2003 at City Shops Apartment, Dr. Yagnik Road, Rajkot, Gujarat, India. We are an eminent Manufacturer, Exporter and Wholesaler of a gamut of Dress Material, Salwar Kameez, Churidar Suits and Kurtis. Our collection consists of Designer Cotton Dress Material, Pure Soft Cotton Dress Material, Unstitched Cotton Dress Material, Glamorous Dress Material and Cotton Printed Dress Material. In addition to this, we offer Designer Printed Kurtis, Ladies Printed Suits, Printed Cotton Salwar Kameez, Simple Embroidery Dress Material, Embroidered Salwar Suits and Fancy and Designer Sarees.